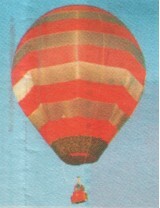 A free balloon, the envelope sown together in an Auckland, New Zealand garage by Brian Boland during the 2002 Christmas period. Flagship weighs only 34 kg and guaranteed for a life of 400 hours. The basket, envelope and accessories weigh a total of 95 kg and the whole rig fits in the back of Peter Boland's station wagon and can be inflated and airborne in about ten minutes. Registered ZK-FAG on 10-06-2003 but during 2002 he flew his tiny craft around the Akaroa landscape.